The Second World War ended in 1945, but you wouldn’t know it from the look of some navies. At least eight countries still operate warships built for service in World War II—and in at least one case much earlier than that. Ships that served in the D-Day invasion, or even the Russian Czar’s Imperial Navy are still plugging along, up to a century after they were first built. Thousands of warships were built by all sides in World War II, from battleships to minesweepers. A large number of these ships, particularly German, Japanese, and Italian ships, were sunk by enemy action or later scrapped. The victors, on the other hand, unloaded ships by the hundreds to friendly postwar navies, many of which ended up bouncing around to two or even three different navies. But this new video from Youtube user Mark Felton Productions shows how the Philippines, Thailand, Russia, Vietnam, Egypt, Taiwan, Mexico, Serbia all still operate World War II-era ships. Although old, some of these ships are typically used as first-line patrol ships by developing countries—the Philippines and its ex-U.S. Navy minesweepers and tank landing ships are one example. 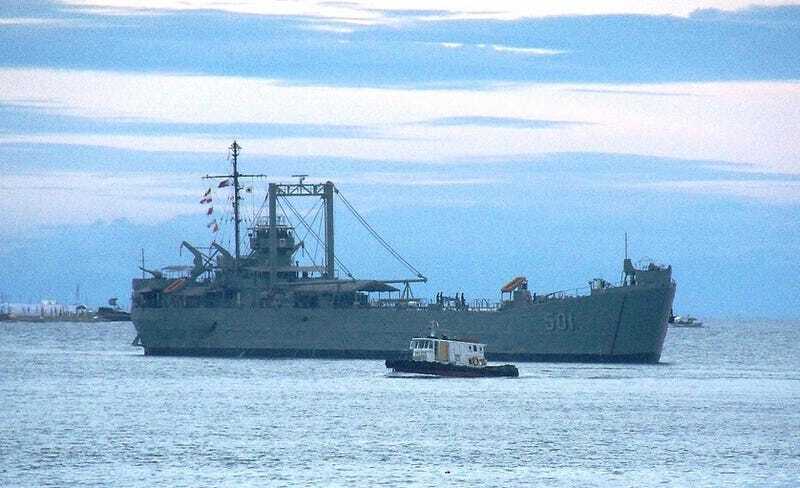 At least two of the Philippine Navy ships are veterans of the Allied landings in Europe, with one having taken part in the D-Day invasion on June 6th, 1944 (BRP Laguna, top) and the lesser known landings in the south of France in August, 1944. Others are veterans of the Korean War and Vietnam War—Vietnam’s ships, in particular, were actually property of the South Korean Navy and were captured when North Vietnam conquered South Vietnam in 1975. Still others belonging to Egypt, Serbia, and Taiwan are used to train naval personnel for future postings on more modern ships, or to give sea cadets a taste of navy life. Kommuna in Russian Navy service, 2008. By far the oldest ship mentioned in the video is the Russian salvage lifting ship Kommuna, a ship so old it has served in three navies under two different names. Laid down in 1912, she entered service with the Czar’s navy in 1915 under the name Volkhov. After the Russian Revolution she was renamed Kommuna and served with the Soviet Navy. Today, 104 years old, she serves with the Russian Navy supporting submersibles. Most of the surviving World War II-era ships are small, displacing two thousand tons or less. Although it’s nice to imagine battleships with their giant 16-inch guns still operating today, the reality is that these ships—in addition to being obsolete—are manpower-intensive and expensive to operate. Smaller ships such as corvettes, minesweepers, and tank landing ships are much easier and cheaper to maintain. And if they’re not broke, why fix them?